Video footage just released by the FBI shows 34-year-old Aaron Alexis as he entered the D.C. Navy Yard before the shooting began. The video is part of this full report released by the FBI, that includes everything the agency knows about Alexis so far. The report has detailed pictures of the rifle Alexis used during the shooting, including close ups of the many strange engravings on the bottom and sides of the gun. The report also confirms much of the information we already know. 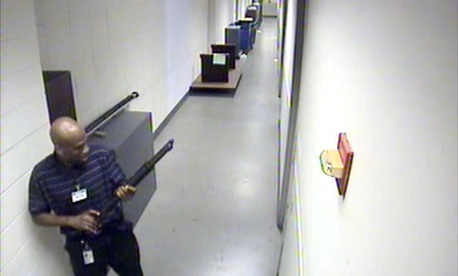 In the days leading up to the shooting, Alexis bought the Remington shotgun from a gun store in Virginia. He was employed as a contractor and was stationed at the Navy Yard beginning at the end of August. Because of his past work in the Navy and his current employment with a contractor, Alexis had full access to the Navy Yard. Then, on September 16, Alexis entered the D.C. Navy Yard building and killed 12 people and injured four more.